The Zohar (Hebrew: זֹהַר‎, lit. "Splendor" or "Radiance") is the foundational work in the literature of Jewish mystical thought known as Kabbalah. It is a group of books including commentary on the mystical aspects of the Torah (the five books of Moses) and scriptural interpretations as well as material on mysticism, mythical cosmogony, and mystical psychology. The Zohar contains discussions of the nature of God, the origin and structure of the universe, the nature of souls, redemption, the relationship of Ego to Darkness and "true self" to "The Light of God", and the relationship between the "universal energy" and man. Its scriptural exegesis can be considered an esoteric form of the Rabbinic literature known as Midrash, which elaborates on the Torah. The Zohar is mostly written in what has been described as a cryptic, obscure style of Aramaic. Aramaic, the day-to-day language of Israel in the Second Temple period (539 BCE – 70 CE), was the original language of large sections of the biblical books of Daniel and Ezra, and is the main language of the Talmud. While the traditional majority view in religious Judaism has been that the teachings of Kabbalah (lit. "tradition") were revealed by God to Biblical figures such as Abraham and Moses and were then transmitted orally from the Biblical era until their redaction by Shimon bar Yochai, modern academic analysis of the Zohar, such as that by the 20th century religious historian Gershom Scholem, has theorized that De Leon was the actual author. The view of some Orthodox Jews and Orthodox groups, as well as non-Orthodox Jewish denominations, generally conforms to this latter view, and as such, most such groups have long viewed the Zohar as pseudepigraphy and apocrypha, while sometimes accepting that its contents may have meaning for modern Judaism. Jewish prayerbooks edited by non-Orthodox Jews may therefore contain excerpts from the Zohar and other kabbalistic works, even if the editors do not literally believe that they are oral traditions from the time of Moses. In the Bible the word "Zohar" appears in the vision of Ezekiel Chapter 8 Verse 2 and is usually translated as meaning radiance or light. It appears again in Daniel Chapter 12 Verse 3, "The wise ones will shine like the radiance of the firmament". However, Isaac evidently ignored the woman's alleged confession in favor of the testimony of Joseph ben Todros and of Jacob, a pupil of Moses de León, both of whom assured him on oath that the work was not written by de Leon. Issac's testimony, which appeared in the first edition (1566) of Sefer Yuchasin, was censored from the second edition (1580) and remained absent from all editions thereafter until its restoration nearly 300 years later in the 1857 edition. Over time, the general view in the Jewish community came to be one of acceptance of Moses de Leon's claims, with the Zohar seen as an authentic book of mysticism passed down from the 2nd century. Believers in the authenticity of the Zohar countered that the lack of references to the work in Jewish literature were because bar Yohai did not commit his teachings to writing but transmitted them orally to his disciples over generations until finally the doctrines were embodied in the Zohar. They found it unsurprising that bar Yochai should have foretold future happenings or made references to historical events of the post-Talmudic period. The authenticity of the Zohar was accepted by such 16th century Jewish luminaries as R' Yosef Karo (d.1575), R' Moses Isserles (d. 1572), and R' Solomon Luria (d.1574), who wrote that Jewish law (Halacha) follows the Zohar, except where the Zohar is contradicted by the Babylonian Talmud. However R Soloman Luria admits in responsa 98 that the zohar can't override a minhag. In the Ashkenazi community of Eastern Europe, religious authorities including the Vilna Gaon (d.1797) and Rabbi Shneur Zalman of Liadi (d.1812) (The Baal HaTanya) believed in the authenticity of the Zohar. Most of Orthodox Judaism holds that the teachings of Kabbalah were transmitted from teacher to teacher, in a long and continuous chain, from the Biblical era until its redaction by Shimon ben Yochai. Many (most?) fully accept the claims that the Kabbalah's teachings are in essence a revelation from God to the Biblical patriarch Abraham, Moses and other ancient figures, but were never printed and made publicly available until the time of the Zohar's medieval publication. The greatest acceptance of this sequence of events is held within Haredi Judaism, especially Chasidic groups. R' Yechiel Michel Epstein (d.1908), and R' Yisrael Meir Kagan (d.1933) both believed in the authenticity of the Zohar. Rabbis Eliyahu Dessler (d.1953) and Gedaliah Nadel (d.2004) maintained that it is acceptable to believe that the Zohar was not written by Rabbi Shimon bar Yochai and that it had a late authorship. Some claim the tradition that Rabbi Shimon wrote that the concealment of the Zohar would last for exactly 1200 years from the time of destruction of the Holy Temple in Jerusalem. The Temple of Jerusalem was destroyed in 70 CE and so before revealing the Zohar in 1270, Moses De Leon uncovered the manuscripts in a cave in Israel. Many statements in the works of the Rishonim (medieval commentors who preceded De Leon) refer to Medrashim that we are not aware of. He writes that these are in fact references to the Zohar. This has also been pointed out by R' David Luria in his work "Kadmus Sefer Ha'Zohar". The Zohar's major opponent Elijah Delmedigo refers to the Zohar as having existed for "only" 300 years. Even he agrees that it was extant before the time of R' Moses De Leon. It is impossible to accept that R' Moshe De Leon managed to forge a work of the scope of the Zohar (1700 pages) within a period of six years as Scholem claims. Many of the Midrashic works achieved their final redaction in the Geonic period. Some of the anachronistic terminology of the Zohar may date from that time. The "borrowings" from medieval commentaries may be explained in a simple manner. It is not unheard of that a note written on the side of a text should on later copying be added into the main part of the text. The Talmud itself has Geonic additions from such a cause. Certainly this would apply to the Zohar to which there did not exist other manuscripts to compare it with. Concerning the Zohar's lack of knowledge of the land of Israel, Scholem bases this on the many references to a city Kaputkia (Cappadocia) which he states was situated in Turkey not in Israel. A city by this name located in Israel does appear, however, in Targum Onkelos, Targum Yonatan, Mishnah, Babylonian Talmud and several Midrashim. Belief in the authenticity of the Zohar among Orthodox Jewish movements can be seen in various forms online today. Featured on Chabad.org is the multi-part article, The Zohar's Mysterious Origins by Moshe Miller, which views the Zohar as the product of multiple generations of scholarship but defends the overall authenticity of the text and argues against many of the textual criticisms from Scholem and Tishby. The Zohar figures prominently in the mysticism of Chabad. Another leading Orthodox online outlet, Aish.com, also shows broad acceptance of the Zohar by referencing it in many of its articles. Some in Modern Orthodox Judaism reject the above view as naive. Some Orthodox Jews accept the earlier rabbinic position that the Zohar was a work written in the Middle Medieval Period by Moses de Leon, but argue that since it is obviously based on earlier materials, it can still be held to be authentic, but not as authoritative or without error as others within Orthodoxy might hold. The first systematic and critical academic proof for the authorship of Moses de Leon was given by Adolf Jellinek in his 1851 monograph "Moses ben Shem-tob de Leon und sein Verhältnis zum Sohar" and later adopted by the historian Heinrich Graetz in his "History of the Jews", vol. 7. The young kabbalah scholar Gershom Scholem began his career at the Hebrew University in Jerusalem with a famous lecture in which he promised to refute Graetz and Jellinek, but after years of strained research Gershom Scholem contended in 1941 that de Leon himself was the most likely author of the Zohar. Among other things, Scholem noticed the Zohar's frequent errors in Aramaic grammar, its suspicious traces of Spanish words and sentence patterns, and its lack of knowledge of the land of Israel. Yeshayahu Leibowitz, noted professor of philosophy at the Hebrew University of Jerusalem, claimed "It is clear that the Zohar was written by de Leon as it is clear that Theodore Herzl wrote Medinat HaYehudim (The Jewish State)." Other Jewish scholars have also suggested the possibility that the Zohar was written by a group of people, including de Leon. This theory generally presents de Leon as having been the leader of a mystical school, whose collective effort resulted in the Zohar. Even if de Leon wrote the text, the entire contents of the book may not be fraudulent. Parts of it may be based on older works, and it was a common practice to ascribe the authorship of a document to an ancient rabbi in order to give the document more weight. It is possible that Moses de Leon considered himself to be channeling the words of Rabbi Shimon. Scholem's views are widely held as accurate among historians of the Kabbalah, but like all textual historical investigations, are not uncritically accepted; most of the following conclusions are still accepted as accurate, although academic analysis of the original texts has progressed dramatically since Scholem's ground-breaking research. 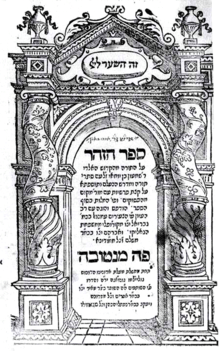 Scholars that continue to research the background of the Zohar include Yehudah Liebes (who wrote his doctorate degree for Scholem on the subject of a Dictionary of the Vocabulary of the Zohar in 1976), and Daniel C. Matt, also a student of Scholem, who is currently reconstructing a critical edition of the Zohar based on original unpublished manuscripts. Tikunei haZohar, which was printed as separate book, includes seventy commentaries called "Tikunim" (lit. Repairs) and an additional eleven Tikkunim. In some editions Tikunim are printed that were already printed in the Zohar Chadash, which in their content and style also pertain to Tikunei haZohar. Mention should also be made of the work of Elliot Wolfson (Professor of Jewish Mysticism, New York University), who has almost single-handedly challenged the conventional view, which is affirmed by Idel as well. Wolfson likewise recognizes the importance of heteroerotic symbolism in the kabbalistic understanding of the divine nature. The oneness of God is perceived in androgynous terms as the pairing of male and female, the former characterized as the capacity to overflow and the latter as the potential to receive. Where Wolfson breaks with Idel and other scholars of the kabbalah is in his insistence that the consequence of that heteroerotic union is the restoration of the female to the male. Just as, in the case of the original Adam, woman was constructed from man, and their carnal cleaving together was portrayed as becoming one flesh, so the ideal for kabbalists is the reconstitution of what Wolfson calls the male androgyne. Much closer in spirit to some ancient Gnostic dicta, Wolfson understands the eschatological ideal in traditional kabbalah to have been the female becoming male (see his Circle in the Square and Language, Eros, Being). In the 17th century, it was proposed that only Jewish men who were at least 40 years old could study Kabbalah, and by extension read the Zohar, because it was believed to be too powerful for those less emotionally mature and experienced. Founded in the 3rd century CE by Plotinus, The Neoplatonist tradition has clear echoes in the Zohar, as indeed in many forms of mystical spirituality, whether Jewish, Christian or Muslim (see Avicenna, Maimonides, and Aquinas). The concept of creation by successive emanations of God in particular is characteristic of neoplatonist thought. In both Kabbalistic and Neoplatonist systems, the Logos, or Divine Wisdom, is the primordial archetype of the universe, and mediates between the divine idea and the material world. For example, the neoplatonist Proclus describes the Logos in terms of the "One beyond being". This primordial unity then, though self-complete, overflows with potency and from this power creates the manifold world beneath it. This downward movement from unity to multiplicity he calls Procession. The reverse process of Reversion is then the lower lifeforms, such as humanity, ascending back toward God through spiritual contemplation. Jewish commentators on the Zohar expressly noted these Greek influences. The relationship between God's absolute Unity and Divine manifestations, may be compared to a man in a room - there is the man himself, and his presence and relationship to others in the room. In Hebrew, this is known as the Shekhinah. It is also the concept of God's Name - it is His relationship and presence in the world towards us. The Wisdom (literally written as Field of Apples) in kabbalistic terms refers to the Shekhinah, the Divine Presence. The Unknowable One (literally written as the Miniature Presence) refers to events on earth when events can be understood as natural happenings instead of God's act, although it is actually the act of God. This is known as perceiving the Shekhinah through a blurry, cloudy lens. This means to say, although we see God's Presence (not God Himself) through natural occurrences, it is only through a blurry lens; as opposed to miracles, in which we clearly see and recognize God's presence in the world. The Holy Ancient One refers to God Himself, Who is imperceivable. (see Minchas Yaakov and anonymous commentary in the Siddur Beis Yaakov on the Sabbath hymn of Askinu Seudasa, composed by the Arizal based on this lofty concept of the Zohar). Within the descending Four Worlds of Creation, each successive realm perceives Divinity less and apparent independence more. The highest realm Atziluth-Emanation, termed the "Realm of Unity", is distinguished from the lower three realms, termed the "Realm of Separation", by still having no self-awareness; absolute Divine Unity is revealed and Creation is nullified in its source. The lower three Worlds feel progressive degrees of independence from God. Where lower Creation can mistake the different Divine emmanations as plural, Atziluth feels their non-existent unity in God. Within the constricted appearance of Creation, God is revealed through various and any plural numbers. God uses each number to represent a different supernal aspect of reality that He creates, to reflect their comprehensive inclusion in His absolute Oneness: 10 Sephirot, 12 Partzufim, 2 forms of Light, 2 Partzufim and 3 Heads in Keter, 4 letters of the Tetragrammaton, 22 letters of the Hebrew alphabet, 13 Attributes of Mercy, etc. All such forms when traced back to their source in God's infinite light, return to their state of absolute Oneness. This is the consciousness of Atziluth. In Kabbalah, this perception is considered subconsciously innate to the souls of Israel, rooted in Atzilut. The souls of the Nations are elevated to this perception through adherence to the 7 Laws of Noah, that bring them to absolute Divine Unity and away from any false plural persepectives. There is an alternative notion of three in the Zohar that are One, "Israel, the Torah and the Holy One Blessed Be He are One." From the perspective of God, before constriction in Creation, these three are revealed in their source as a simple (non-compound) absolute Unity, as is all potential Creation from God's perspective. In Kabbalah, especially in Hasidism, the communal divinity of Israel is revealed Below in the righteous Tzadik Jewish leader of each generation who is a collective soul of the people. In the view of Kabbalah, however, no Jew would worship the supernal community souls of the Jewish people, or the Rabbinic leader of the generation, nor the totality of Creation's unity in God itself, as Judaism innately perceives the absolute Monotheism of God. In a Kabbalistic phrase, one prays "to Him, not to His attributes". As Kabbalah sees the Torah as the Divine blueprint of Creation, so any entity or idea in Creation receives its existence through an ultimate lifeforce in Torah interpretation. However, in the descent of Creation, the Tzimtzum constrictions and impure Qliphoth side of false independence from God results in distortion of the original vitality source and idea. Accordingly, in the Kabbalistic view, the non-Jewish belief in the Trinity, as well as the beliefs of all religions, have parallel, supernal notions within Kabbalah from which they ultimately exist in the process of Creation. However, the impure distortion results from human ascription of false validity and worship to Divine manifestations, rather than realising their nullification to God's Unity alone. Unlike the Zohar, Christianity interprets the coming of the Messiah as the arrival of the true immanence of God. Like the Zohar the Messiah is believed to be the bringer of Divine Light: "The Light (the Messiah) shineth in the Darkness and the Darkness has never put it out", yet the Light, although being God, is separable within God since no one has seen God in flesh: "for no man has seen God..." (John 1). It is through the belief that Jesus Christ is the Messiah, since God had vindicated him by raising him from the dead, that Christians believe that Jesus is paradoxically and substantially God, despite God's simple undivided unity. The belief that Jesus Christ is "God from God, Light from Light" is assigned as a mystery and weakness of the human mind affecting and effecting our comprehension of him. The mystery of the Trinity and our mystical union with the Ancient of Days will only be made, like in the Zohar, in the new Garden of Eden, which is made holy by the Light of God where people's love for God is unending. ↑ Scholem, Gershom and Melila Hellner-Eshed. "Zohar". Encyclopaedia Judaica. Ed. Michael Berenbaum and Fred Skolnik. Vol. 21. 2nd ed. Detroit: Macmillan Reference USA, 2007. 647–664. Gale Virtual Reference Library. Gale. ↑ Beyer 1986: 38–43; Casey 1998: 83–6, 88, 89–93; Eerdmans 1975: 72. 1 2 3 4 5 6 7 8 9 10 11 12 13 14 15 16 17 18 19 20 21 22 Jacobs, Joseph; Broydé, Isaac. "Zohar". Jewish Encyclopedia. Funk & Wagnalls Company. ↑ Scharfstein, Sol (2004). Jewish History and You II. Jewish History and You. Jersey City, New Jersey: KTAV Publishing House. p. 24. ↑ "Rabbi Shimon Bar Yochai - Lag BaOmer at". Ou.org. Retrieved 2012-06-06. ↑ "Enter The Zohar". enterthezohar.com. Retrieved 2012-06-06. ↑ "Revealing The Zohar". kabbalah.info. Retrieved 2012-06-06. ↑ "And because Yisrael will in the future taste from the Tree of Life, which is this book of the Zohar, they will go out, with it, from Exile, in a merciful manner." – Zohar, Vol. 3, 124b, Ra'aya Meheimna; et al. ↑ "... the children [of Yisrael] below will shout out in unison and say, "Shem'a Yisrael/Hear O Yisrael!" but there will be no voice and no reply... so is whoever causes the Kabbalah and the Wisdom to be removed from the Oral Torah and from the Written Torah, and causes people to not endeavor in them, and says that there is nothing other than the pshat in the Torah and the Talmud. Certainly it is as if he removes the flow from that River and from that Garden. Woe to him! Better for him that he were not created in the world and did not learn that Written Torah and Oral Torah! For it is considered of him as if he returned the world to tohu vavohu (unformed and void) and he causes poverty in the world and prolongs the Exile." —Tikunei haZohar #43, p. 82a; et. al. ↑ Available at HebrewBooks.org: ספר יוחסין השלם, p. 88-89 / 95-96 (Hebrew). ↑ Dan Rabinowitz in Hakirah, The Flatbush Journal of Jewish Law and Thought, volume 2 (fall 2015), Nekkudot: The Dots that Connect Us, p. 64. ↑ See Rabbi Menachem Schneerson (the Tzemach Tzedek), Likkutei Sichos, Vol. 33, p. 98, where the author, quoting a response Reb Hillel Paritcher related from Rabbi Shneur Zalman of Liadi (the Baal HaTanya) (quoted also in the beginning of Shar Kakolel) explains that where there is an argument between Kabbalah and Poskim (legal scholars), the former should be followed. For it is impossible to say that the Kabbalah is in contradiction with the Talmud itself. Rather, the Kabbalists and the legal scholars have variant understanding of the explanation of the Talmud. See also Rabbi David ben Solomon ibn Zimra (the Radvaz) (Chelek 4, Siman 1,111) and Rabbi Tzvi Hirsch ben Yaakov Ashkenazi (the Chacham Tzvi) (Siman 36) (cited in Shaarei Teshuva 25:14). See also the Responsa of Menachem Schneerson (Responsa Tzemach Tzedek A.H. Siman 18,4) and Divrei Nechemia (Responsa Divrei Nechemia O.H. 21). It should be noted however that the views of the Radvaz and of the Chacham Tzvi are that one should follow the opinion of the Zohar only where a conclusive statement has not been made by the legal authorities (Gemara or Poskim), or when an argument is found between the Poskim. The above quoted view, attributed to the Baal HaTanya, would thus be accepted as authoritative by followers of the Baal HaTanya, followers of the Ben Ish Chai, and followers of other Halacha codifiers who accept to follow the rulings of Kabala over those of the Poskim. Such include: some Chassidim, select Sefardim, and other well known groups. ↑ See עמל ורעות רוח וחרמות ותשובתם (Hebrew) by Rabbi Yiḥyeh Qafeḥ. ↑ "Sinai". Daat.ac.il. Retrieved 2012-06-06. ↑ Miller, Moshe (2012-02-07). "The Zohar's Mysterious Origins". Chabad.org. Retrieved 2012-06-06. ↑ Doktór, Jan; Bendowska, Magda (2012). "Sefer haZohar – the Battle for Editio Princeps". Jewish History Quarterly. 2 (242): 141–161. Retrieved 30 January 2014. 1 2 3 4 5 6 7 8 9 10 11 Much of the information on contents and sections of the Zohar is found in the book Ohr haZohar(אור הזוהר) by Rabbi Yehuda Shalom Gross, in Hebrew, published by Mifal Zohar Hoilumi, Ramat Beth Shemesh, Israel, Heb. year 5761 (2001 CE); also available at http://israel613.com/HA-ZOHAR/OR_HAZOHAR_2.htm, accessed March 1, 2012; explicit permission is given in both the printed and electronic book "to whoever desires to print paragraphs from this book, or the entire book, in any language, in any country, in order to increase Torah and fear of Heaven in the world and to awaken hearts our brothers the children of Yisrael in complete teshuvah". ↑ For example, the Porta Coelorum of Rabbi Abraham Cohen Irira, which forms the third part of Rosenroth's Apparatus in Librum Sohar, was written expressly to exhibit the correspondences between Kabbalistic dogmas and the Platonic philosophy. (See A.E. Waite, The Holy Kabbalah: a study of the secret tradition in Israel, London 1924, reprinted 1996), p.71ff. 1 2 3 Jacobs, Joseph; Broydé, Isaac. "Zohar". Jewish Encyclopedia. Funk & Wagnalls Company. ↑ "The Nicene Creed — Origins and Development | Traditional Christianity". Traditionalchristianity.wordpress.com. 2011-10-05. Retrieved 2014-08-17. ↑ "CATHOLIC ENCYCLOPEDIA: Monotheism". Newadvent.org. 1911-10-01. Retrieved 2014-08-17. ↑ "John 1 - Matthew Henry's Commentary - Bible Commentary". Christnotes.org. Retrieved 2014-08-17.